The theater of Marcellus as depicted by Giovanni Battista Piranesi in the early modern period illustrates how later civilizations grow in, through, around and on top of earlier civilizations. From the perspective of the phenomenon of civilization, i.e., civilization understood at its furthest reach of generality (which might also be called a meta-civilizational perspective), one would expect to find not only patterns of development of civilizations, as was Toynbee’s project to identify, but one would also expect to find patterns by which one civilization gives way to, or is transformed by or into, another civilization. In other words, a big picture perspective on civilization would reveal both intra-civilizational structures and inter-civilizational structures. Both of these are structures in time — ways in which things change. Diocletian’s Palace at Split is another wonderful example of how a later civilization will grow like weeds within the interstices of an earlier civilization, displacing what came before but also preserving it — what Hegel called aufheben. Civilizations, like individuals, swim in the ocean of history, and we can say of civilization what Marx said of men, viz. that civilizations make their own history, but they do not make it as they please; they do not make it under self-selected circumstances, but under circumstances existing already, given and transmitted from the past. Each civilization is heir to the history that preceded it, and is in turn the ancestor of each civilization and succeeds it. In several posts I have discussed the work of Toynbee, not least because he is the most devoted to the idea of civilization as the proper object of study of historiographic inquiry. Toynbee’s focus on civilization means that, even when he gets things wrong, he usually has something interesting to say. Apart from the list of fully developed civilizations that Toynbee recognized, he also discussed abortive civilizations and arrested civilizations. Among the abortive civilizations he included the Celtic Fringe of early Christianity and the Viking world. Among arrested civilizations he included the Eskimo, Polynesians, and nomads of the Asiatic steppe. In Why We Are All Eskimos I tried to show how Toynbee was wrong to call Eskimos an arrested civilization. Obviously, when Toynbee made this claim, he was thinking that civilizations began in temperate regions and spread from areas more friendly to the full development of civilization to regions less friendly to the development of fully developed civilizations. Toynbee did not know what we know now in terms of the detailed paleoclimatology of the Earth. Scientific historiography since Toynbee’s time has revealed to us new worlds of knowledge that are not derived from any text, unless we count the world itself as a text, and our genetic structure as well. Toynbee had it exactly backward with the Eskimos: they are not an arrested side branch of the main stream of civilization; they are the robust channel flowing inexorably from past glaciations, as though swollen with the meltwater of an entire ice age. “Eskimos” broadly speaking are the ancestors of us all, because all human ancestors had to come through the test of the ice age in order for them to be present to found the civilizations that have flourished during the present interglacial period. I am beginning to think that Toynbee also had modern Western civilization exactly backward also. Toynbee begins his examination of civilizations by taking as examples of civilization, “…twenty-one societies of the species to which our Western Society belongs.” (A Study of History, Vol. 1, I, C, III, a, p. 147) Toynbee is honest about the fact of beginning with his own civilization, but I think that there is a legitimate question here as to whether our civilization today is modern civilization in the strict and narrow sense, or whether our civilization is a successor civilization to that of modernity. Let me try to explain this. There is a sense which modern civilization has triumphed, especially in its Western form, but there is another sense in which modernity proved to be abortive, and we can speak of an abortive modern civilization that never fulfilled its promise because it was overtaken by events. What I mean is that modern civilization taken in its strict and narrow sense was displaced by another kind of civilization while modernity was still in its developmental stage. What displaced modern civilization was industrial-technological civilization, which is sufficiently different from what was developing as modernity prior to industrialization that it may deserve to be considered another kind of civilization entirely. Some time ago, when I wrote a few posts on early modern Europe, particular in reference to Christopher Hill’s book The World Turned Upside Down, I received a comment from Christopher Thompson, who had been a student of Christopher Hill. Professor Thompson scolded me for suggesting that early modern English was not, “a ‘peasant society’ or even a predominantly peasant one.” He was right to call me on this. It is worthwhile to read in its entirety Professor Thompson’s comment on my post (follow the link above and go to the bottom of the page), since he summarized in a few sentences the complexity and diversity of early modern English society. In a later post of mine, Modernism without Industrialism: Europe 1500-1800, I tried to sketch the peculiar civilization of Europe of the early modern period, which I have come more and more to see as a kind of civilization that was only just getting off the ground when it was overtaken by the violent transformation of society initiated by the Industrial Revolution. This period of modernism without industrialism can be understood as an abortive form of modern civilization — a civilization cut short and which never attain maturity on its own terms. As Professor Thompson pointed out, this was not a predominantly peasant society; in other words, it was not a medieval society. Throughout the early modern period we see a very gradually increasing division of labor and the social differentiation that this implies. The elaborate feudal structures of carefully gradated hierarchy was being slowly replaced by another kind of social gradation not as explicitly hierarchical as that of the Middle Ages. The scientific revolution was making itself felt, literacy was becoming more widespread, and at the end of this period we have two great political revolutions — the American Revolution and the French Revolution — both of which can be understood in isolation from the first stirrings of industrialization, which were starting about the same time. It is possible to imagine, as an exercise in counter-factual historiography, a world that might have followed from the combined effects of the scientific revolution and the American and French revolutions but without the industrial revolution. While we are at it, we can just as well attempt to imagine a world that might have followed from modernity, the Enlightenment, and the scientific revolution without the political revolutions or the industrial revolution. I think this would have been a civilization much more similar to that of the Roman Empire at its height — relatively wealthy, cosmopolitan, internationalist, essentially agrarian and rural despite the existence of a few very large cities — than what we now know as industrial-technological civilization. If we can identify modernity as an abortive civilization, like the Christian Celtic Fringe and the Vikings (according to Toynbee), overtaken by industrial-technological civilization, we must acknowledge that the transition from one civilization to another was relatively seamless, despite the social upheavals that attended industrialization. There was no “dark age” between modernity and industrialization, and in this respect the transition from modernity to industrialization resembles the transition from medievalism to modernity. Again, there was no “dark age” between medieval and modern civilization, but there was a transition nevertheless. It has often been remarked that the modern world is continuous with the medieval world in several important ways, even while there is little in history that has been as completely abandoned as medieval civilization and its institutions. I would like to suggest that, when one civilization more-or-less seamlessly gives way to another civilization, without an intervening dark age or similar massive disruption of institutions, what is happening is that the ordinary business of life, the accidents of life (in the Aristotelian sense of “accident”), go on uninterrupted — which is to say that they evolve gradually so that very little change is noticed from one generation to the next, but that these gradual changes in the ordinary business of life accumulate and eventually add up as significant social change. At the same time that the accidents of life are undergoing gradual change, the essence of a civilization is undergoing relatively rapid change, so that the more-or-less identical practices passed from one generation to the next have a very different meaning because they are now accidents of a different essential nature. Given the continuity of the medieval and modern worlds, how do we know that one civilization gave way to another? Well, one indicator species of the climax civilizational ecosystem of medievalism was the cathedral. Monumental architecture often serves as an indicator species of climax civilizational ecosystems. What the pyramids were to the Egyptians, what temples and baths were to classical antiquity, and what the skyscraper is to industrial-technological civilization, the cathedral (and the palace) was to medieval civilization. Hans Memling, St Ursula Shrine: Arrival in Cologne (scene 1), ca. 1489, Oil on panel, 35 x 25,3 cm., Memlingmuseum, Sint-Janshospitaal, Bruges, Belgium. Once medieval European civilization reached a given level of stability and wealth, cathedrals went up rather quickly, sometimes in a single generation. Some magnificent palaces were erected on a time scale not at all unlike monumentral architecture in our time, say 5-10 years — easily within the lifetime of a single master builder. Some monumental projects stalled, however, and once stalled they tended to remain stalled, sometimes for hundreds of years. A good example of this would be the Cologne cathedral, which was an enormous undertaking, and when it was abandoned the civilization that began it essentially lost interest in it. Abandoned in its unfinished state, the construction crane on top of the south tower became iconic in its own right, appearing in depictions of Cologne throughout the intervening centuries. 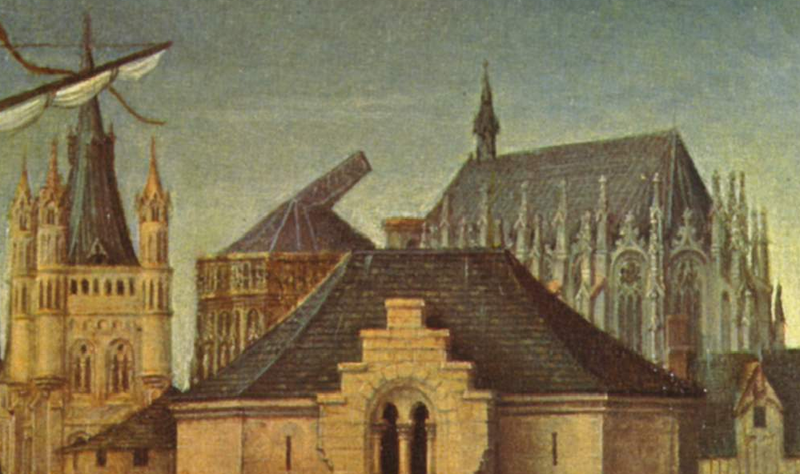 This detail from the above Hans Memling painting shows the construction of Cologne cathedral already abandoned in 1489 (work had ceased in 1473); the cathedral was to remain in this unfinished form until construction was resumed in 1842. Cologne cathedral was eventually completed, but it was not completed by medieval civilization. Medieval civilization was utterly extirpated by the time that the cathedral was completed by different men with a different agenda. During the nineteenth century there was a vogue for medievalism that is called “neo-gothic,” and during this time there were a few cities, Cologne among them, who dusted off the unfinished medieval plans to their cathedrals and decided to finish them. The Houses of Parliament in London date from the same period, and are a classic example of neo-gothic architecture. But the monumental rock-cut tombs of Lycia, along the Turkish coast, many of which were abandoned unfinished, were not completed by later civilizations that displaced the classical antiquity in which these monumental projects were initiated. Perhaps too much had changed, too much time had elapsed between the phases of surplus wealth of the dominant regional civilization, and probably also it was the non-continuous transition between civilizations. 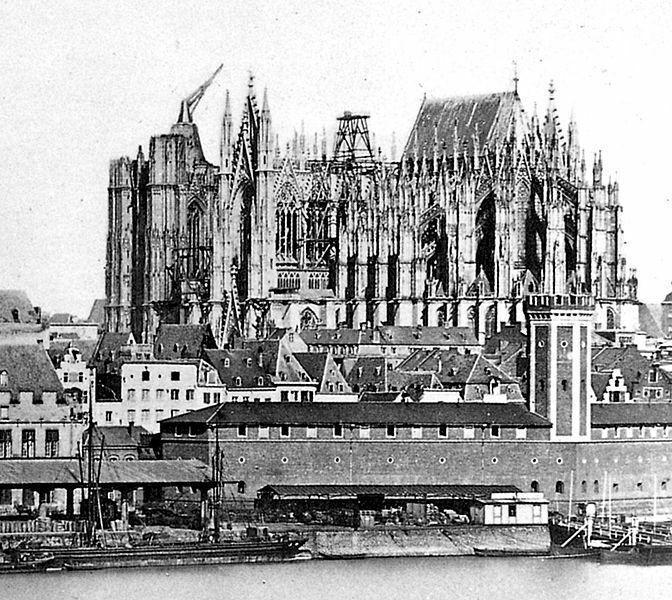 A photograph of the unfinished Cologne cathedral in 1856, from Köln in frühen Photographien 1847-1914, Schirmer/Mosel Verlag, München, 1988. The medieval construction crane is still visible on the south tower. Thus when we see industrial-technological civilization completing the work of modernism, we ought not to assume that this is one and the same civilization; if industrial-technological civilization is essentially different from that of modernity prior to with without industrialization, then the choice to continue and complete the monumental projects of modernity can be understood as an exercise in inter-generational piety — rather than worshiping our immediate ancestors, we continue and complete their projects, even if these projects mean something very different to us than the projects meant for them. If we make the distinction between the essence and accident of civilized life as I have tried to do above, I think we come to a better appreciation both of the temporal structures of intra-civilizational change and the temporal structures of inter-civilizational change. Intra-civilizational change is marked by essential continuity and accidental discontinuity; inter-civilizational change is marked by essential discontinuity and accidental continuity.